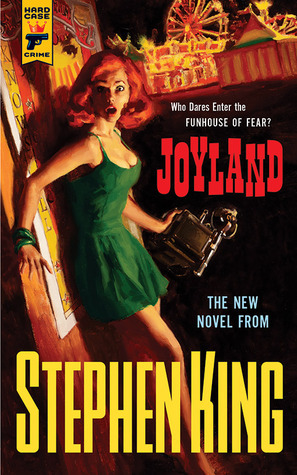 First the disclaimer: I am not a Stephen King fan, and that’s mainly because I’m not a reader of horror fiction, but Joyland is a Hard Case Crime title, and I’m Hard Case fan. I mention not being a Stephen King fan because he is a popular author and while I’m sure that Joyland is going to attract new readers, I can’t say how this book compares to his other work. While I’d never read a Stephen King novel, I’ll admit to a mild curiosity due to the fact that I have watched and enjoyed a number of films based on his work. The films I’ve seen frequently explore the themes of innocence vs evil, youth and the loss of innocence, the layers beneath small town American life, and, all this of course, often laced with the supernatural. 1973 was the year of the OPEC oil embargo, the year Richard Nixon announced he was not a crook, the year Edwin G. Robinson and Noel Coward died. See what I mean about the nostalgia? It’s hard these days to imagine a time when anyone imagined that politicians were anything other than ____, ____, _____, ____ (fill in the blanks), but back in the day, a number of people were genuinely shocked about Watergate. Notice how the author weaves in several issues is that little sentence: petrol rationing, concerns about energy, unrest in the Middle East, political crookery, and rather interestingly, the death of one of the acting greats who immortalized the portrayal of gangsters on the screen. This is a badly broken world, full of wars and cruelty and senseless tragedy. Every human being who inhabits it is served his or her portion of unhappiness and wakeful nights. Those of you who don’t already know that will come to know it. Given such sad but undeniable facts of the human condition, you have been given a priceless gift this summer: you are here to sell fun. In exchange for the hard-earned dollars of your customers, you will parcel out happiness. Children will go home and dream of what they saw here and what they did here. King is not a subtle writer, but then again I think many of the moves he makes here are very deliberate. The place names are so obvious, you trip over them: Joyland, Heaven’s Bay, Heaven Beach, but these very obvious elements to the story are matched by elements that are not so screamingly obvious. The carnival workers, for example, are a motley bunch, and no one seems to be quite who they say they are. Devin, that clean-cut American boy, so clean-cut that he’s a virgin and drinks milk, takes a room at Mrs Shoplaw’s Beachside Accomodations. She’s an interesting woman who is generous, kind, and welcoming to her summer lodgers–again there’s that sense of a world that doesn’t exist. It’s Mrs. Shoplaw who tells Devin about the ghost that haunts Joyland’s Horror House, the ghost of a girl who was brutally murdered on the ride–her throat slit and her body dumped beside the tracks. The murder was never solved. There’s something very innocent about Devin, and sometimes innocence is a protection and at other times it’s a liability. Devin, of course, becomes involved in the old murder case while also losing that innocence and finally accepting some truths about his life. Joyland is an unusual title for Hard Case Crime. It’s not hard-boiled, but crimes are committed, and because this is, after all, Stephen King, there’s a supernatural element to the tale. I’ve read reviews of the book that call it a masterpiece, and while I wouldn’t go that far, nonetheless, I’m glad I read it. After watching many Stephen King film adaptations, Joyland is about what I expected with its theme of the power of the good against the power of evil. The transition to adulthood is a dodgy period in which an individual can make any number of bad choices, but in Devin’s case, he repeatedly does good deeds and takes a definite stand against evil. The penultimate scene is presaged by Devin’s actions within the park, and incidents in which he doesn’t think, he acts. Each of these incidents are seemingly unconnected, but in reality, in a mystical sort of way, Devin is repeatedly tested by fate and with each incident, his aura of goodness strengthens for the moment of his final battle. As odd as this may sound, I thought about King Arthur’s Knights of the Round Table and how the knights had to sally forth on quests that basically became the moral measure of each man. The story’s nostalgia is nicely conveyed with Devin still not quite come to terms with the people he met and lost, so consequently the story is laced with a patina of loss and sadness. I read a lot of Stephen King’s early novels years ago. He is a very entertaining writer, though i found him very derivative of others. This really sounds like a change of pace for him. The loss sand sadness that you describe here that also was something often present in his earlier works. Thanks for commenting Brian. I hoped someone familiar with this author’s work would have an opinion on his themes. I love that cover. Damn. Anyway, I think you nailed it when you noted that King is not a subtle writer. Having read a good many of his novels, I couldn’t agree more. That said, I’m looking forward to this one. His most recent novels have all been changes of pace. Perhaps you can teach an old dog new tricks. Hard Case Crime covers are great, aren’t they? Glad to know that my overall impression of not being subtle continues in other books. I never thought of King as a pure horror writer and, as Ryan commented, in the last years he seems to write fewer classical horror novels. I’ve got this one too and read the first page so far and that feeling of nostalgia hit me immediately. Maybe it’s not so subtle what he does but it’s not easy. In a way you have read a paranormal crime novel. I have seen a few of the movies based on his books too and many were quite good hich just shows that the ideas and plots are good. Will you read more of him? I’ve only seen the film adaptations of the horror-type films. Although I suppose Misery (my favourite BTW) pushes that genre. Yes you are right, I don’t think what he does is easy–although I think he makes it look easy. You know what I mean. I’ve always thought about reading Misery and I’ve been curious to read King as I like his ideas. I’ve read virtually all of King – despite being put off initially by the very schlocky covers they used to have in the 70s, and not being into any other horror writers – and I really rate him. Right from the start he makes you want – need – to know what happens and, very importantly, makes you care about the people he introduces, so that the compulsion to read on is not just curiosity but an emotional connection. He can transcend genre, but for the most part is happy to work within it; he can go for the gross-out but his power really resides in his ability to make you connect with his characters, and in his ability to make goodness as compelling as evil. Not all of King’s books are great, but none are less than readable, and many will repay re-reading. So, read Misery, as a starter. You might also find it interesting to read James Smythe’s blog http://www.guardian.co.uk/books/series/rereading-stephen-king. Enjoy! Thanks for the comment. I’m really curious about Misery–always have been since I saw the film, so I should spring for the book and check it out. Yes, I don’t think you’ll find Misery a disappointment. Another one more or less along the same lines in that the story pulled me along was Cujo. Now reading 11/22/63. It’s the first King I’ve read in years and I chose it for the nostalgia factor. Isn’t 11/22/63 one of the really long books? Yes, it is, around 850 pages. I’m about 2/3 finished and so far there have only been maybe 20-30 pages that went on a bit too long for me. I just finished a 600 page + book from Trollope. Took me about 6 weeks of reading a little every day. I have read one of his books when I was a teenager but I don’t remember which one. Horror is not my cup of tea, in films or in books. I love the film The Shawshank Redemption, which is based upon one of his stories. This one won’t make me read him again. I didn’t know he’d written the story behind the Shawshank redemption. Can’t say I liked that film much…BUT I will check out Misery. King;s early work tends towards supernatural horror, his later towards psychological horror. This sounds closer to the former than the latter, and perhaps better for that for as you say he’s not a subtle writer. Shawshank is based on a short story. I wouldn’t seek it out if you’re not a King fan and didn’t much like the film. I’ve been thinking about the nostalgia factor of the novel which was one of its stronger points. Nostalgia makes for a rich field of exploration when it comes to novels, but then again since the past is being idealised, it can also verge towards the sentimental, and that’s when I tune out. This wasn’t sentimental–although the territory is close. I’m going to stick with Misery as that’s got to be nasty. I didn’t see the book as about fear and suspense as much as about nostalgia. The narrator seems to weigh his lost relationship and lost friends along with solving the crime. You wouldn’t normally think of these things as equal weight–murder is more serious. But since this tale is told 40 years later, King shows us what still bothers the narrator, and it’s those unresolved questions about his old girlfriend and what might have been–not the crime. I think that’s the most interesting element of the book.